November was an insane month, and a big part of that was my decision to participate in my very first NaNoWriMo or National Novel Writing Month. I’ve had so many people tell me I should write a cookbook, and I plan to, but I’ve always wanted to write a fun and frivolous murder mystery and decided this was the event to give me the kick in the pants. I’m happy to say that I’m now over 50,000 words into my novel and though I have more to go, I’ll no longer be trying to get thousands of words a day to meet a deadline. That means I’ll be back to posting more regularly! December is going to be full of affordable edible gifts, holiday dinner dishes and seasonal options. See you Monday! Congratulations—that is SO awesome and I can’t wait to read your novel (and your cookbook). Yay! Congrats!! This was my third year and third win, and I can tell you that once you’ve won, you’ll want to do it every year! 🙂 Did you go to any write-ins? 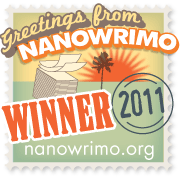 I’m moving up to the Seattle area in a couple months, and wondering what the NaNoWriMo community is like. I didn’t Zoe. It was such a busy month that most of my writing took place at bed time. I know there were several though. Really my only participating this year was writing. If I’m up for it next year I hope to get more involved. Are you a blogger too? I don’t have one yet, but stick around!